Update: Confirmed fixes April 2018 update as well. Are you having issues connecting to VPN services on Windows 10 Creators Update 1703? If so then read on. Having installed Windows 10 Creators Update everything was working well with no real issues for me other than needing to re-install the Dell Audio application that the Microsoft updated decided I probably didn’t need anymore. Anyway, only a minor inconvenience and it was fixed pretty quickly. One day when I needed to connect to a client over VPN, now this VPN was setup using the Windows VPN client with all settings set to auto and the vpn address set to vpn.myclient.com. It had been working perfectly on Windows 7, Windows 8.1 and up to Windows 10 Anniversary update. At first, I suspected maybe the client’s sysadmin was a little trigger happy and disabled my account, nope client confirms account and VPN access is enabled. Now a little suspicious I tried to connect back to my company using VPN (I almost never do this as there is little need these days with Office 365 and Internet-facing applications) and that’s not working either. So now I’m two for two VPN’s, not working. Searching the internet returned many suggestions, but in the end, the one that worked was “deleting” and redetecting the Miniport drivers. There are more nuclear options, but I was looking for the least nuclear option and luckily this worked for me! 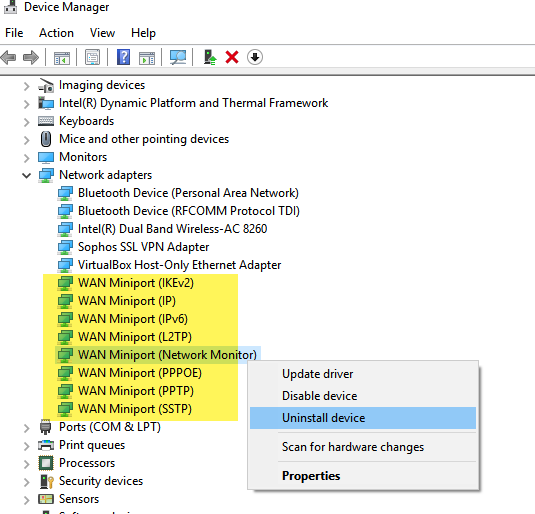 Figure: Uninstall All WAN Miniport* drivers. 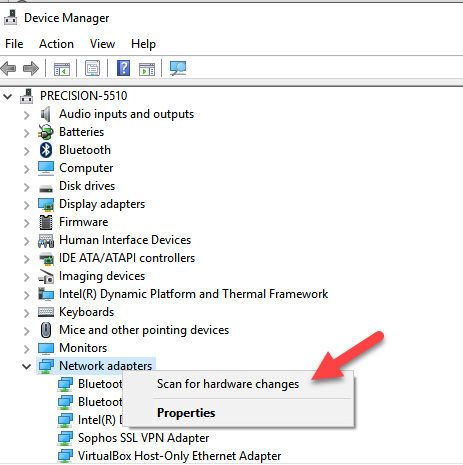 Figure: Right Click Network Adaptors and Scan for hardware changes. So far so good and all VPN services are back up and running. Note: I also have a Sophos VPN client but it wasn’t affected before or after Creators Update. Brilliant, worked for me. I had to reboot after this procedure as well. worked after a reboot for me as well! No problem Wayne, good to see it helped someone else. worked perfect for me! many thanks! Exactly what I needed! YUDAMAN! Had the same issue after upgrade to build 1803. Your solution worked for me as well. Thank you! Please add 1803 to the title as it works for that as well Delete all Miniports scan for hardware changes and Restart.